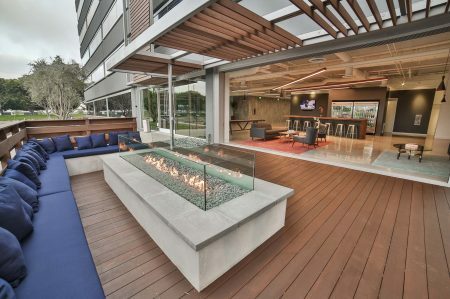 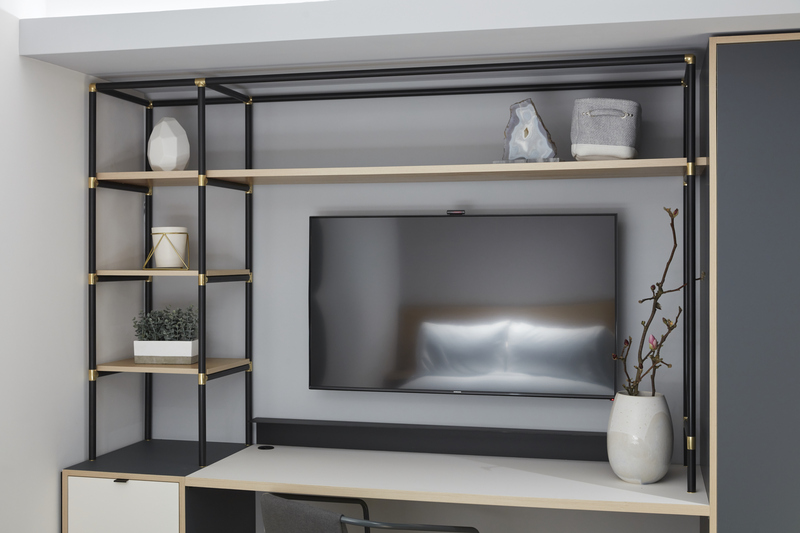 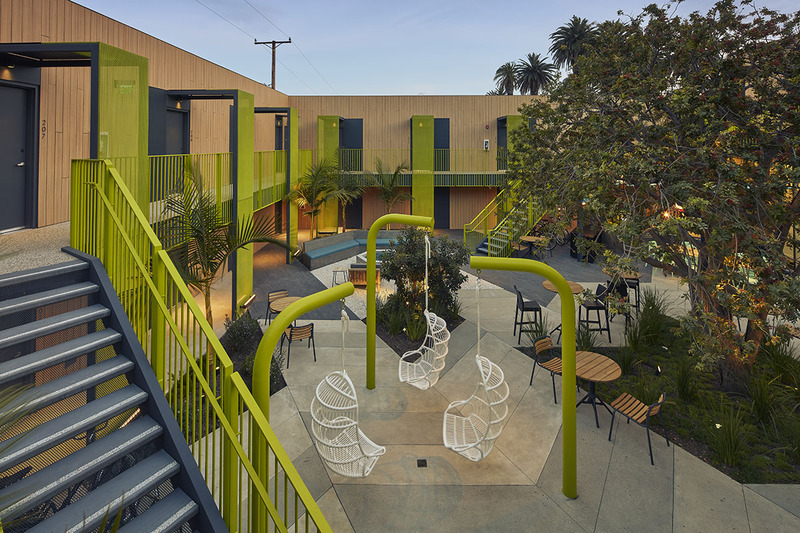 Newly restored 35-unit creative living space catering to the young Silicon Beach professional. 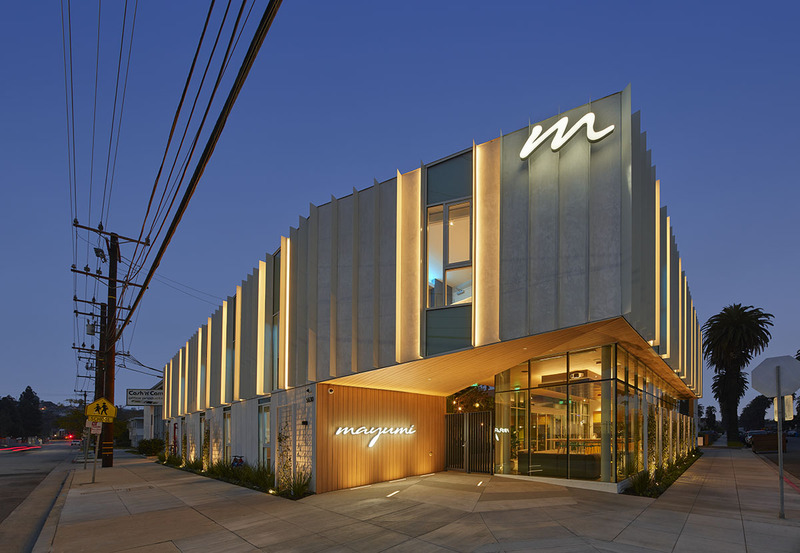 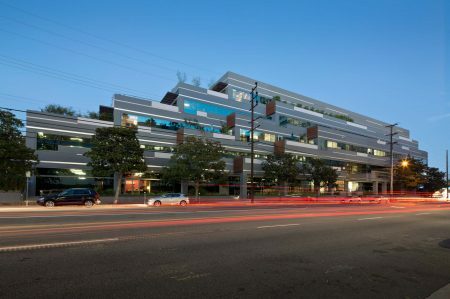 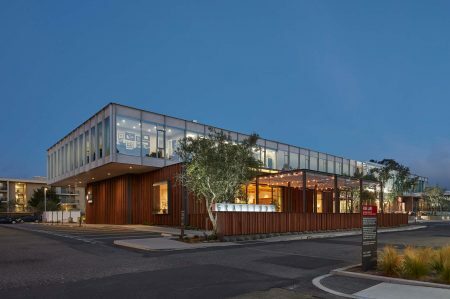 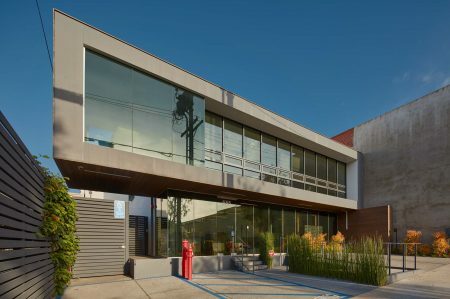 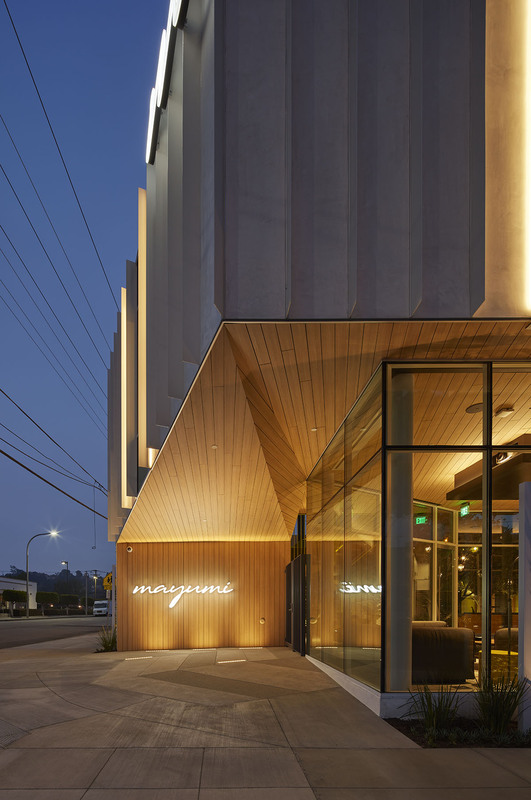 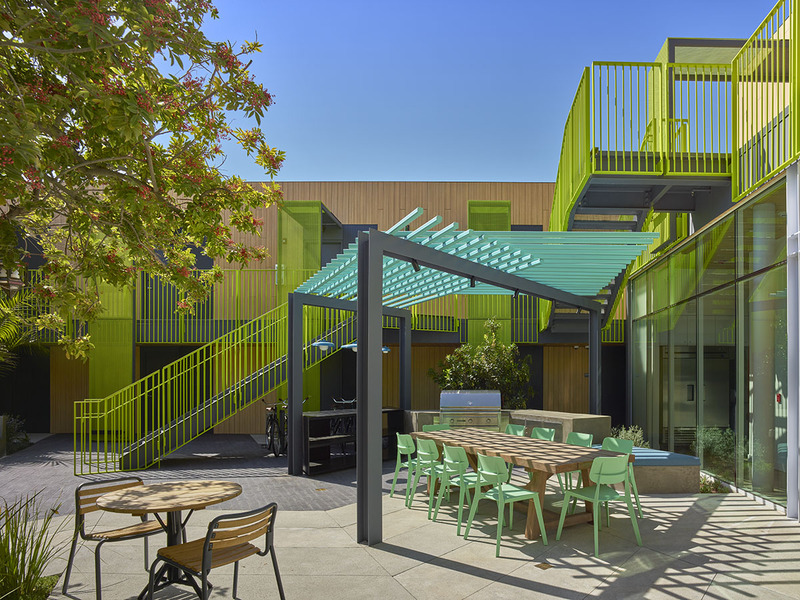 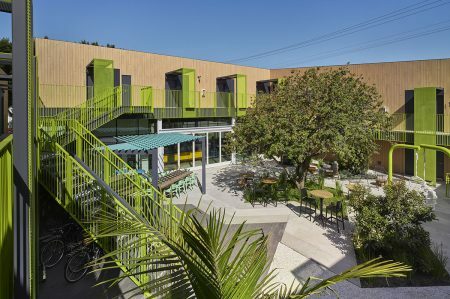 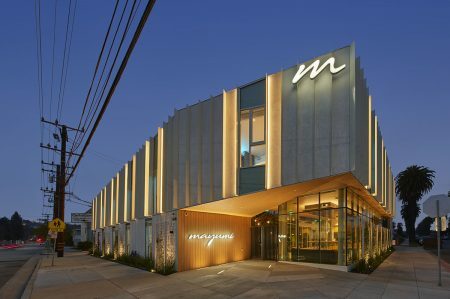 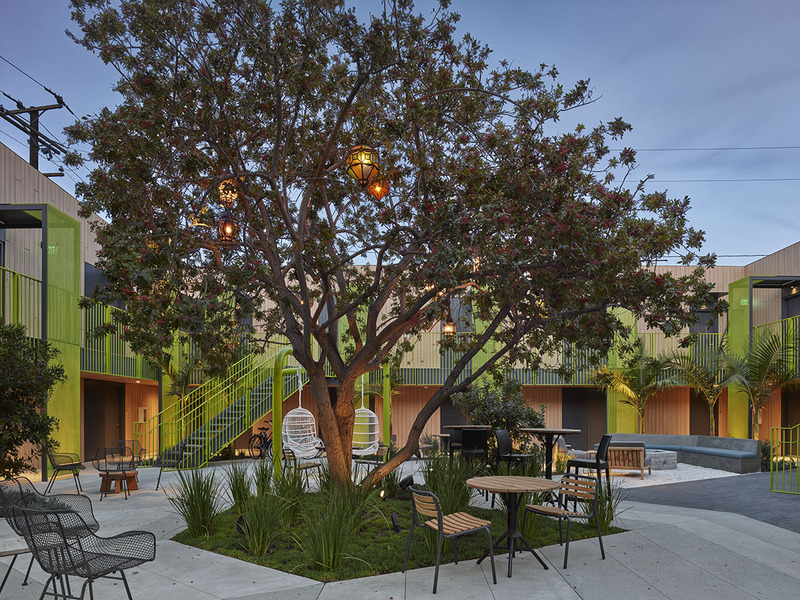 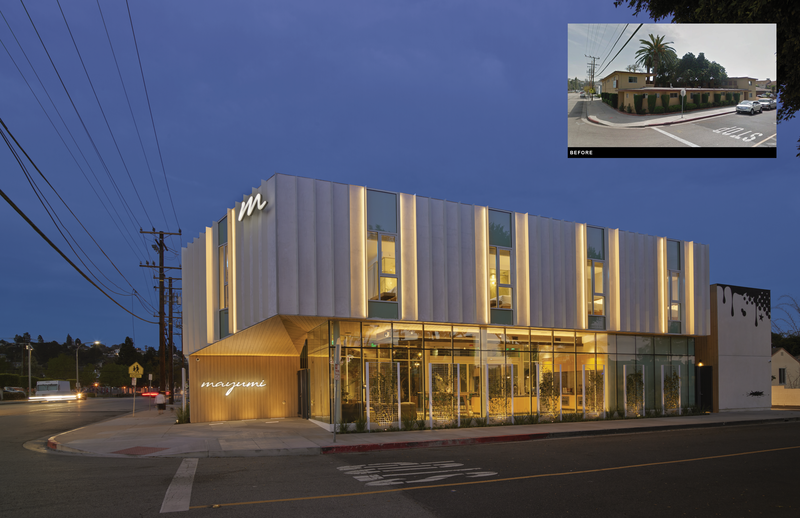 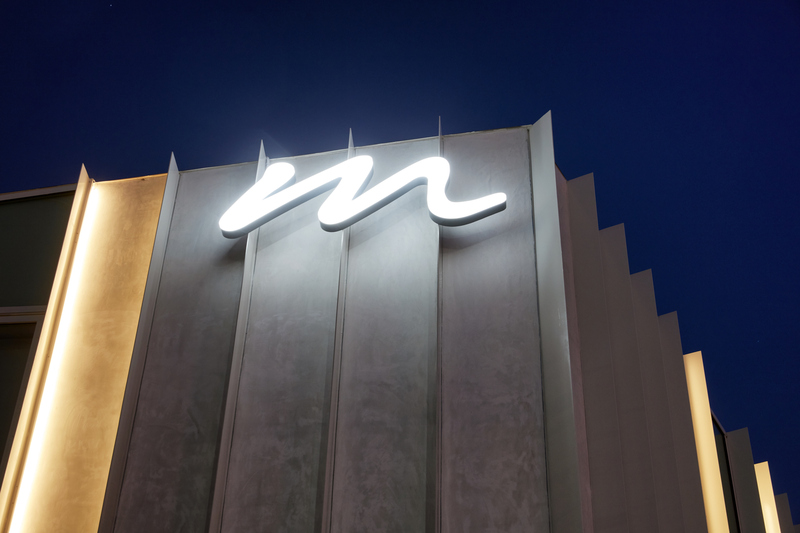 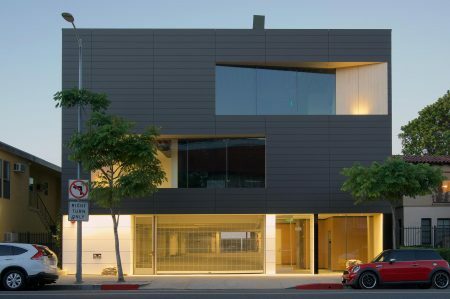 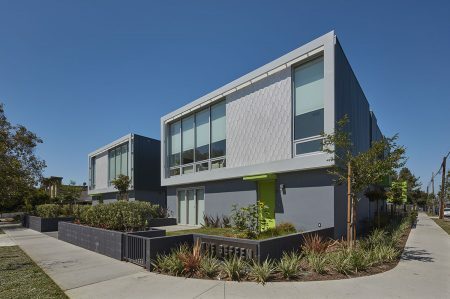 In the urban context of Los Angeles, Mayumi was designed as a courtyard building that clearly defines an outside public face experienced from the street and the automobile, contrasted with a transformative and calm experience in a lush private courtyard on the inside. 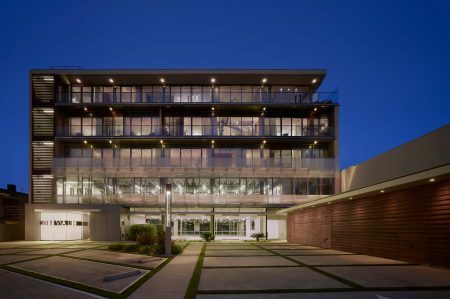 The exterior street façade is an abstract, pristine white plaster shell enveloping the almost perfect square of the courtyard, acting as a protective layer for the building inhabitants, yet inviting to the outside. 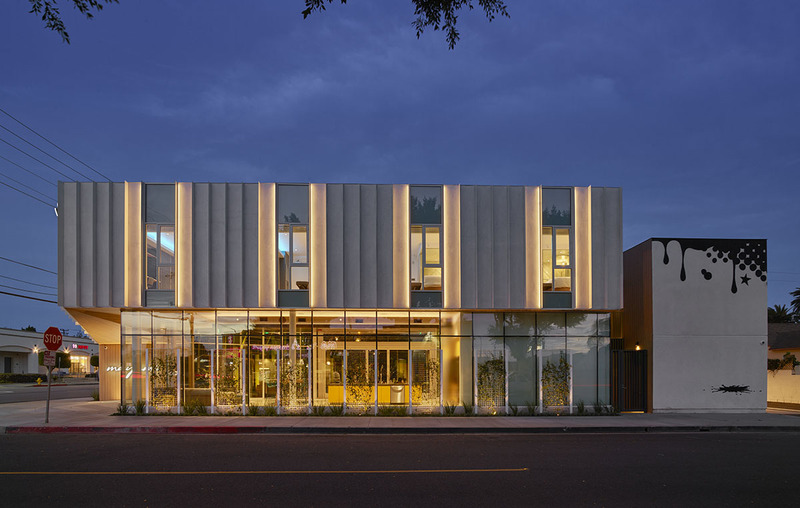 On the second floor the shell is accentuated by the continuous rhythm of white vertical steel fins, and so the perception of the building seems to change – the depth of the fins creating a constantly new perspective as you move along the facade. 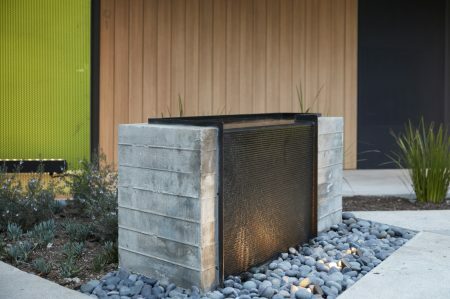 In addition, these fins allow for play of light in the day, while transforming into LED-lit glowing vertical bands at night. 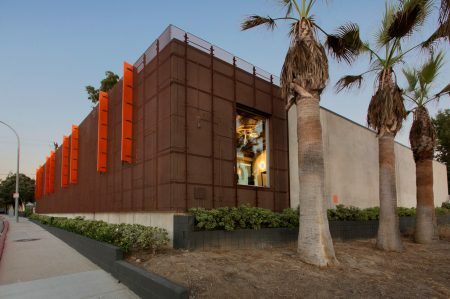 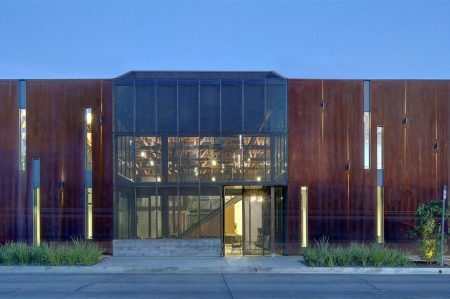 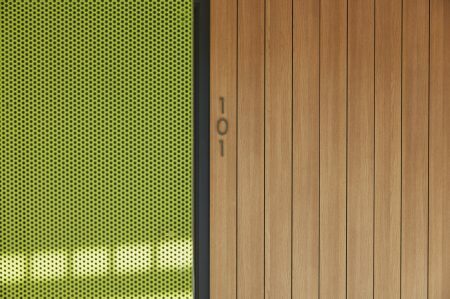 The exterior shell transforms on the street corner, where at the entrance the warmth of the courtyard materiality reveals itself, and the life on the interior: wood-textured panels on walls and ceilings, cut into varied angles, lead into the lush and brightly colored courtyard inside, enveloped by the same paneling on the interior façade. 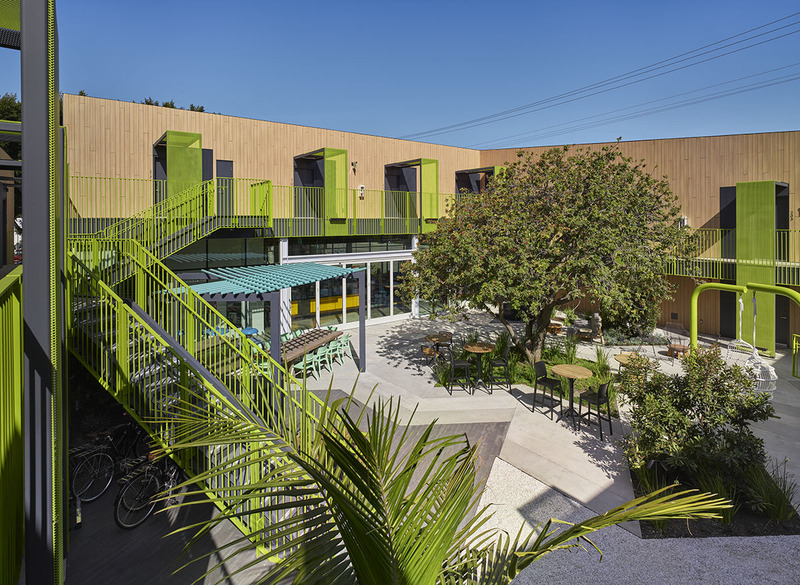 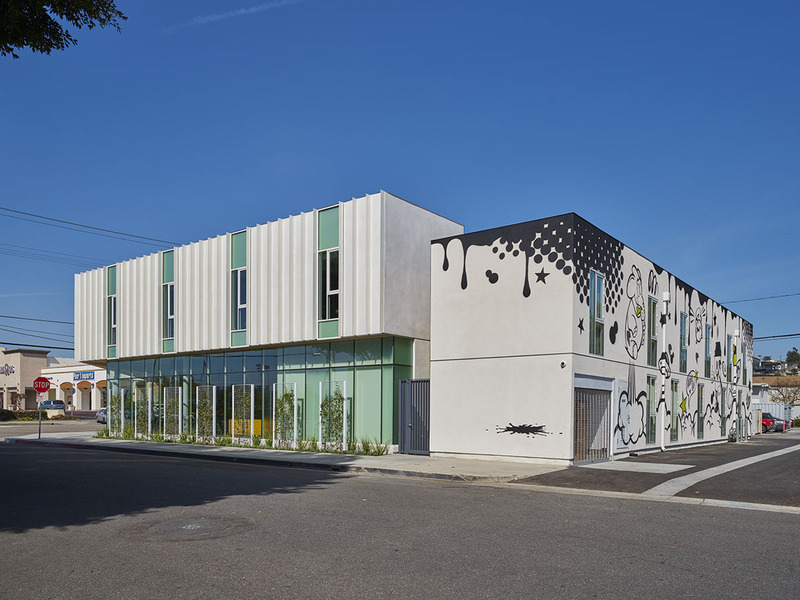 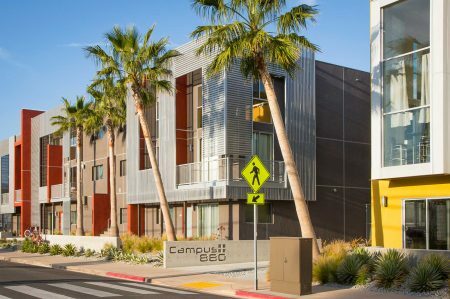 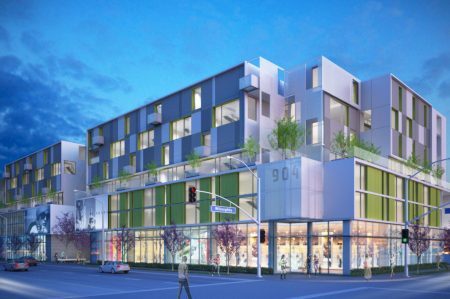 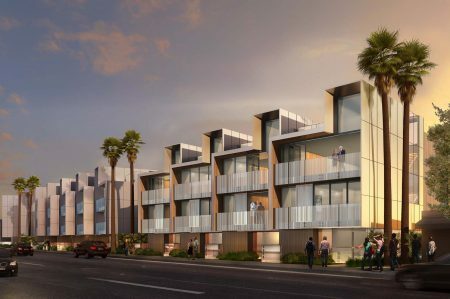 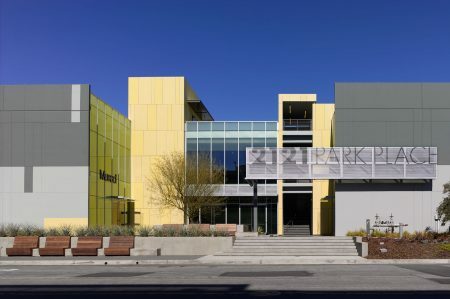 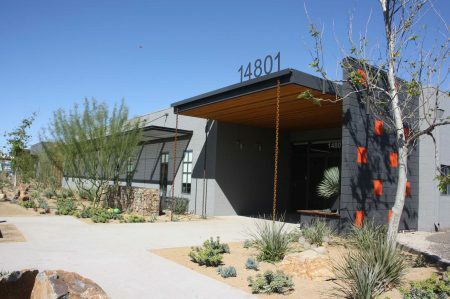 Adjacent to the street corner entrance is a new 2-story structure, housing communal spaces on the ground floor and micro-units on the second floor, the second-floor façade tying into the overall shell of the project. 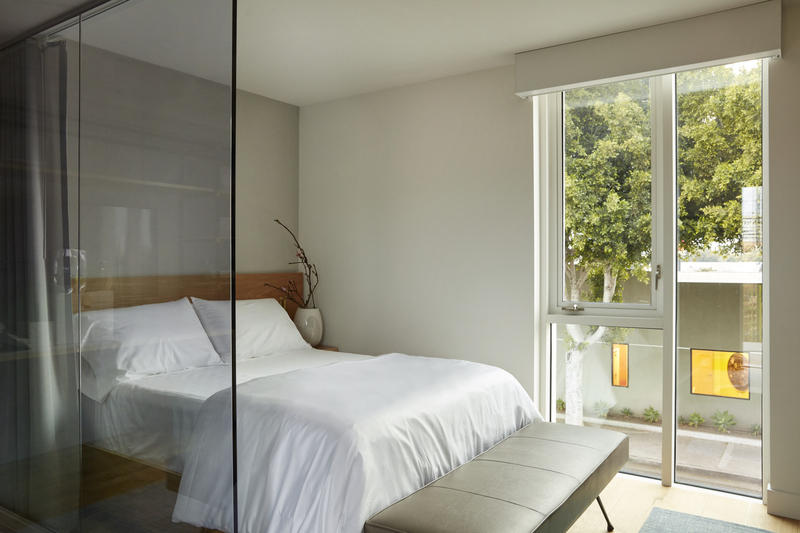 The ground floor is all glass, allowing for views to the inside through a planted, protective screen, further emphasizing the project’s dialogue with the exterior and interior worlds. 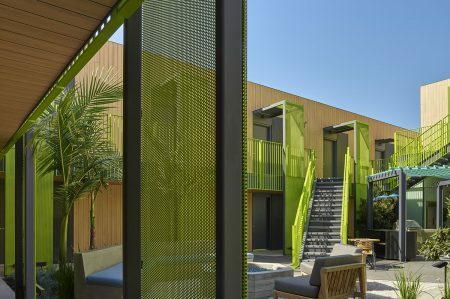 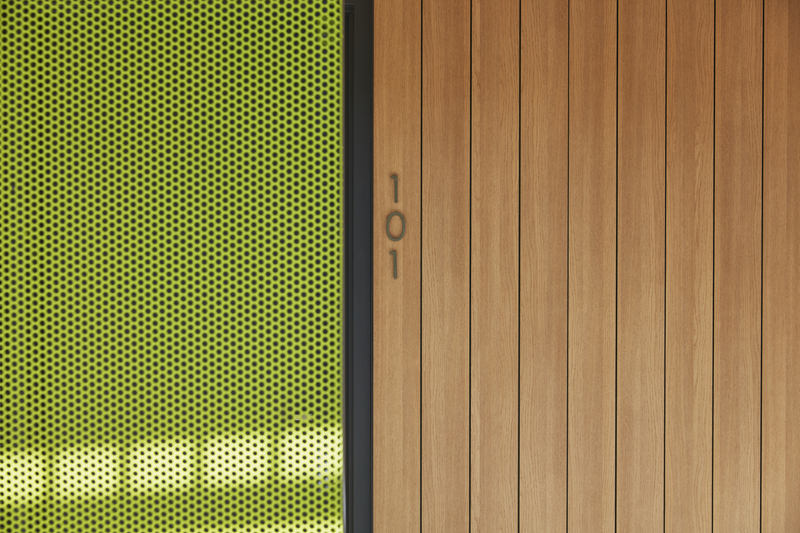 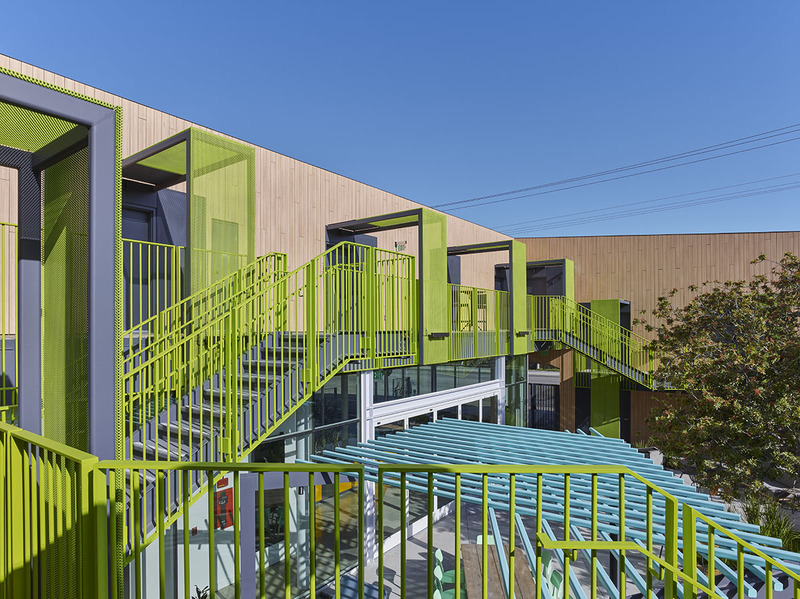 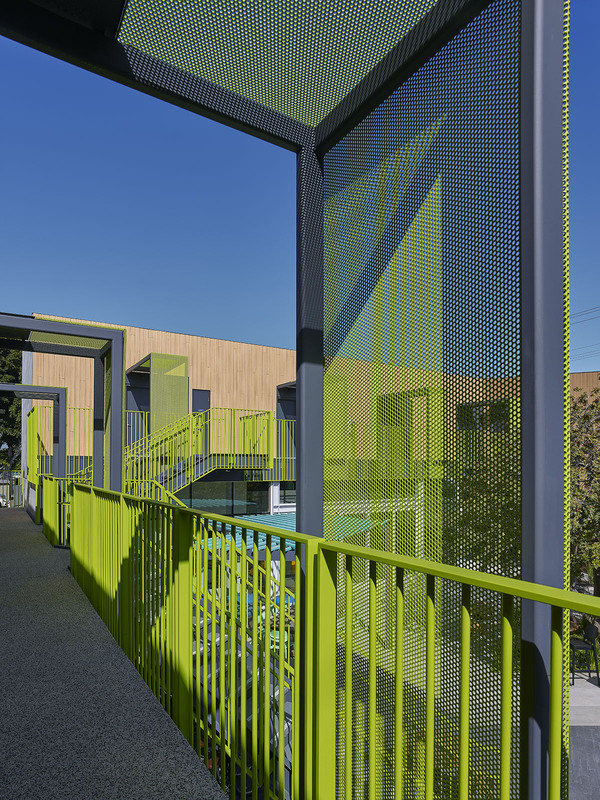 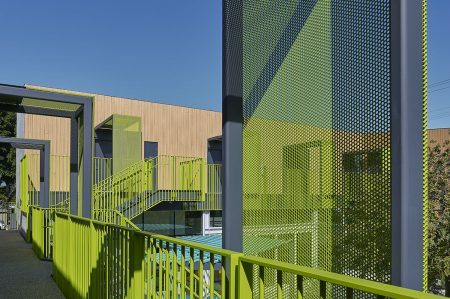 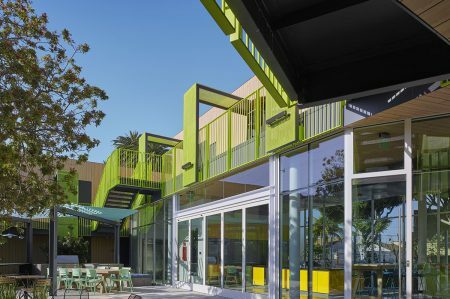 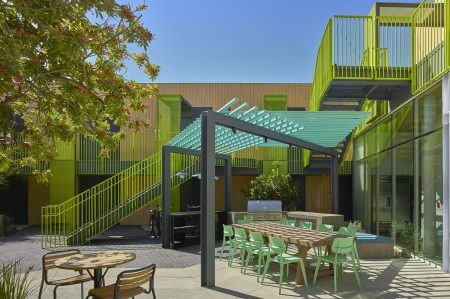 The interior courtyard has a continuous circulation wrapper painted bright green, accentuated with the introduction of custom-fabricated vertical steel structures clad in bright green perforated metal screens. 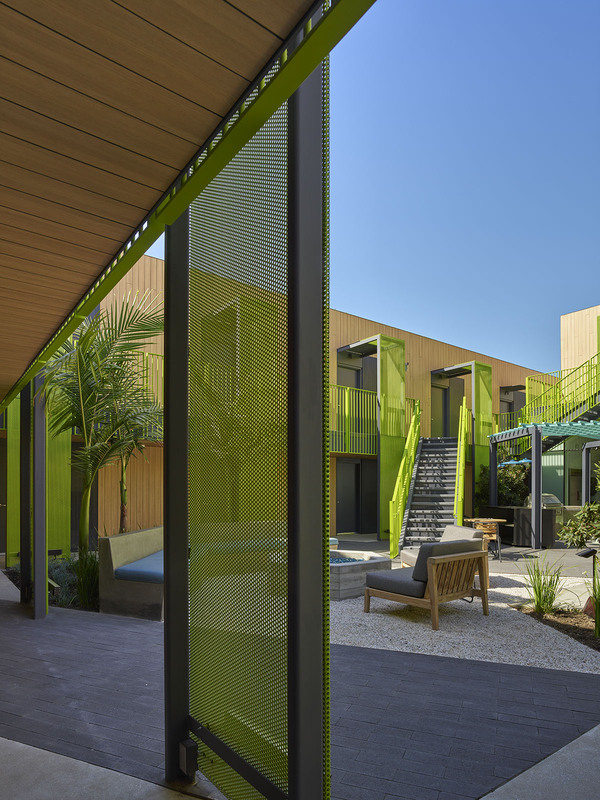 These structures allow for plants to grow and engage with the courtyard façade while at the same time offering privacy at each micro-unit entry. 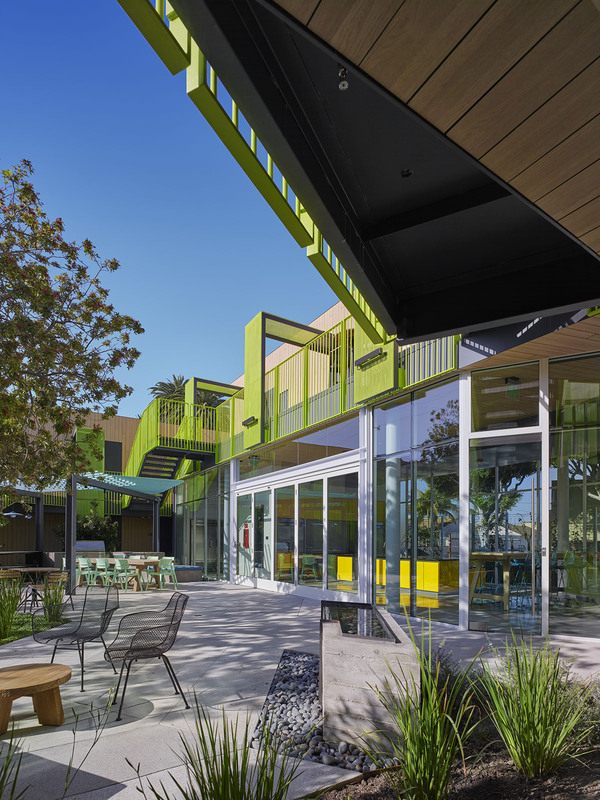 The green color is continued through the circulation supports and frames the courtyard space, complementing the opulent garden below. 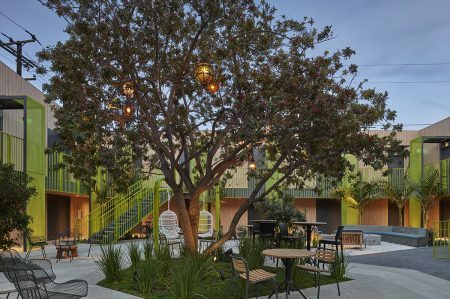 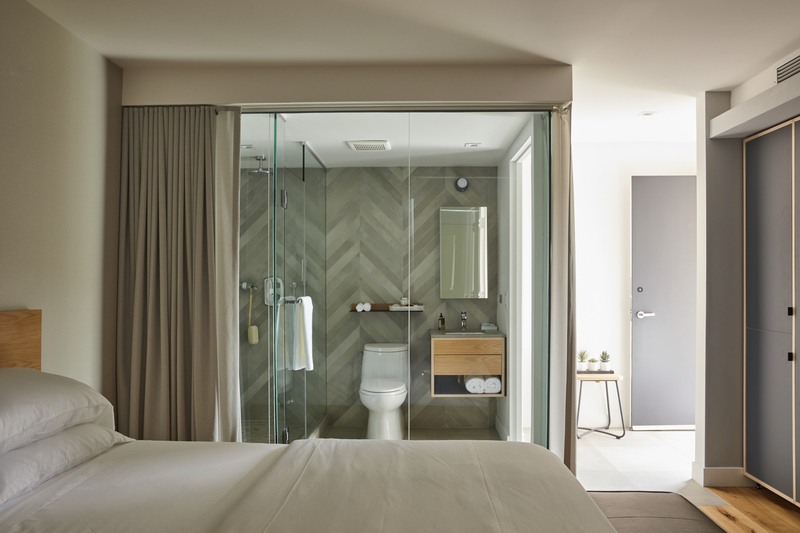 Lining the courtyard are 35 micro-units, each with its own flat screen TV, an en-suite bathroom, built-in features and custom furniture. Together, units and courtyard form a communal space that create an, interactive and playful atmosphere, enticing a new sense of community between inhabitants. 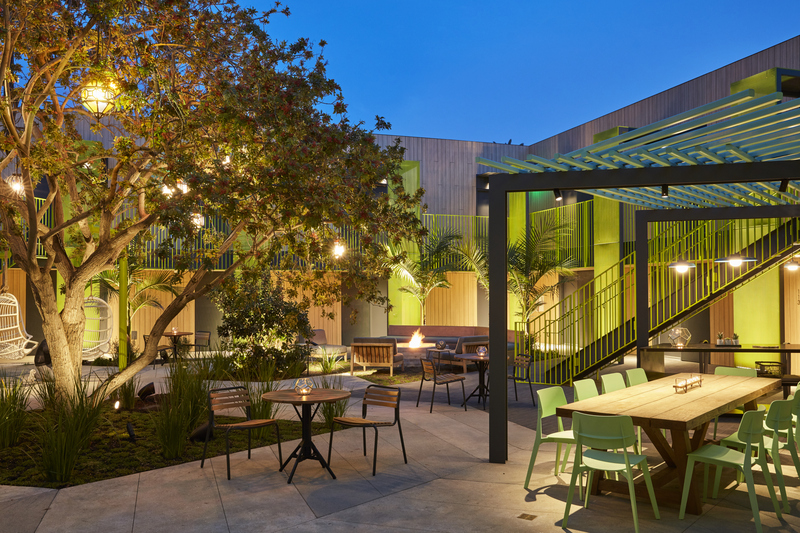 With a warm, vibrant, and lush garden in the courtyard, the interior space is nurturing and provides a space for creative thoughts in a relaxed atmosphere. 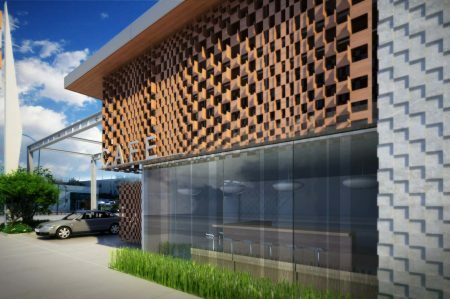 The wood-textured panels on the courtyard facade are carried into the new glazed communal space ceiling, creating a floating atmosphere to the structure above. 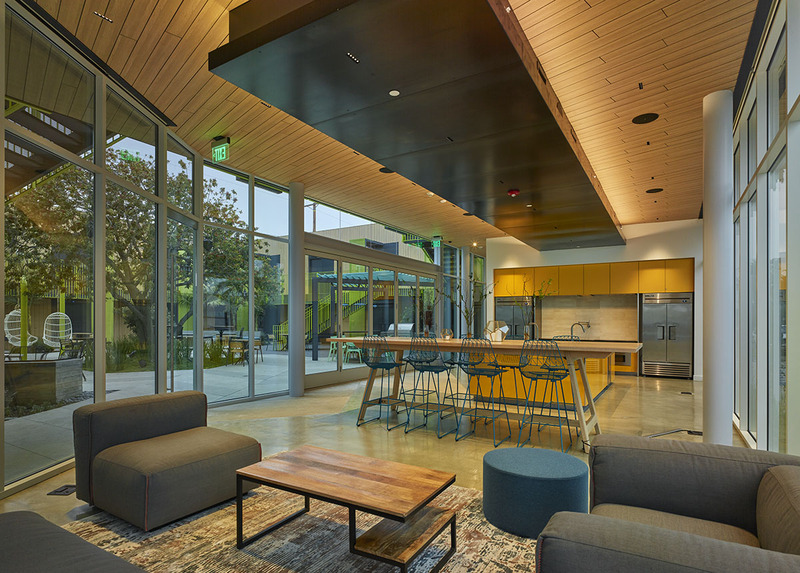 The lounge area and large open kitchen found within, connect directly to the courtyard through large sliding doors, where a fire pit, seating nooks, and shady spots under canopy trees allow for a truly Southern California inside-outside living.